Studija koju je sproveo JDPower, 838 od 1000 ispitanika vlasnika iPhona je reklo da su potpuno zadovoljni kvalitetom i funkcijama iPhona. Ovo nije prvi put da je Apple trijumfovao, vec cak sesti put za redom! Najveca zamerka je bila nedostatak 4G LTE tehnologije. Kao sto vidite na tabeli, za Apple-om kaskaju HTC i Samsung. WESTLAKE VILLAGE, Calif.: 8 September 2011 - Overall satisfaction with smartphones and traditional mobile phones is considerably higher for devices that are a specific size and weight and are equipped with the latest technological advancements, such as high-quality display screens, faster processing speeds, longer battery life and touch screen capabilities, according to the J.D. Power and Associates 2011 U.S. Wireless Smartphone Customer Satisfaction StudySM-Volume 2 and the J.D. Power and Associates 2011 U.S. Wireless Traditional Mobile Phone Satisfaction StudySM-Volume 2, both released today. Satisfaction with both smartphones and traditional or "feature" phones is greatly impacted by the physical design and dimensions of the device. For example, satisfaction ratings are highest (8.1 on a 10-point scale) when the weight of the smartphone device does not exceed 5 ounces. In comparison, satisfaction averages 7.6 for smartphone devices that are 5 ounces or heavier. The same scenario holds true for feature phones, for which satisfaction with the weight of the device peaks between 3 and 3.5 ounces, and drops considerably when the feature phone weighs 4 ounces or more. The width and thickness of the smartphone device are also critical in maximizing the ownership experience, and echo the old adage that "thinner is better" holds true. Overall physical design satisfaction is highest (852 on a 1,000-point scale) for smartphones that are less than 0.45 inches wide. In comparison, satisfaction averages 783 for smartphones that are 0.65 inches wide or wider. Technology advancements also impact the experience of mobile devices in a number of areas. For example, touch screen-only smartphones generate considerably higher satisfaction with ease of operation (817 points) than either QWERTY-only based devices or those that have both a touch screen and QWERTY functions (785 and 782 points, respectively). In addition, faster processing speeds, higher computer chip bit rates and the most advanced display screens (such as Super AMOLED vs. older LCD-based screens) all add significantly to user satisfaction. Even the number of megapixels found in camera-enabled mobile devices influences the ownership experience. In general, the higher the number of megapixels, the higher the satisfaction with camera picture and video quality. However, devices with at least 5 megapixels achieve nearly as high a satisfaction score as those smartphones with 8 megapixels or more. "It's not unexpected that satisfaction is higher for devices that have new technological advances or features," said Kirk Parsons, senior director of wireless services at J.D. Power and Associates. "Having the right combination of physical dimensions and operating functions and features for both smartphones and traditionally equipped devices is key to creating an exceptional ownership experience with each type of wireless device." These two studies have been updated to measure customer satisfaction with traditional wireless handsets and smartphones among owners who have used their current mobile phone for less than one year by examining several key factors. In order of importance, the key factors of overall satisfaction with traditional wireless handsets are: performance (31%); ease of operation (24%); physical design (24%); and features (20%). For smartphones, the key factors are: performance (35%); ease of operation (24%); features (21%); and physical design (20%). For a sixth consecutive time, Apple ranks highest among manufacturers of smartphones in customer satisfaction. Apple achieves a score of 838 and performs well in all factors, particularly in ease of operation and features. 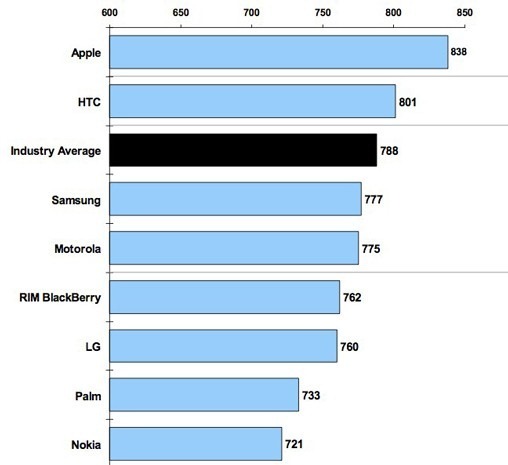 HTC (801) follows Apple in the smartphone rankings. Samsung ranks highest in overall customer satisfaction with traditional handsets with a score of 718. Samsung performs well in three factors: performance, ease of operation and features. LG (717), Sanyo (716) and Sony Ericsson (709) follow Samsung in the traditional handset rankings. • The price of a traditional wireless mobile phone continues to decline and averages $71 in 2011, compared with an average of $81 at the beginning of 2009. The decline is primarily due to discounts provided by handset providers and wireless service carriers to incentivize sales. Currently, 42 percent of owners report having received a free mobile phone when subscribing to a wireless service. • Mobile applications continue to enhance the smartphone user experience. More than two-thirds of owners say they have downloaded games and social networking applications to their device. More than one-half (54%) say they have downloaded entertainment-oriented applications, while 52 percent indicate having downloaded travel software, such as maps and weather applications. This indicates that smartphone owners are continuing to integrate their device usage into both their business and personal lives. • Customers are highly satisfied with 4G-capable devices. Satisfaction among customers using 4G-capable phones averages 819, compared with 786 among customers using phones with 3G capability. Owners of 4G devices are also more active in terms of calling, texting and browsing the Internet. The 2011 U.S. Wireless Smartphone Customer Satisfaction Study-Volume 2 and the 2011 U.S. Wireless Traditional Mobile Phone Satisfaction Study-Volume 2 are based on experiences reported by 6,898 smartphone owners and 8,775 traditional mobile phone owners. Both studies were fielded between January and June 2011. For more information on customer satisfaction with wireless service, wireless retail sales, cell phone handsets, customer care, prepaid wireless service and business wireless service, please visit JDPower.com."